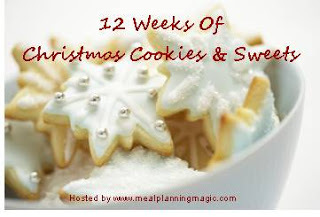 I'm so excited to be joining another group of wonderful bloggers this year for the 12 Weeks of Christmas Cookies! Yes, I know it is only September! But Christmas will be here before we know it, so why not get an early start on all the baking! I would say that this cookie is actually in the top 3 of baked goods in my house. This one being #1 and This one being #2. While it may not be festive, it is definitely good. And Melty and peanut buttery and just plain awesome. In fact, while at Sunday lunch I asked Cameron and the Chef which cookie to start the 12 weeks of Christmas Cookies with and they both said this cookie. If you are a blogger and wanting to join in the fun, just leave me a comment and I will get the information to you so you can join us! The party will last through December 15th this year! I knew once I saw this in the cookbook this dish was going to have to be made. My husband LOVES corn beef hash. Any chance that he can order it, he does. I had never tried it before but considering I know how much he loves, I knew it would be made. This recipe led to a very interesting conversation in the grocery store when it came time to buying the said corn beef. Chef thought it would call for fresh corn beef like from the meat section of the grocery store. I thought it would come from the canned meat area of the grocery store. I had written the amount I needed on my list and he kept insisting that I was buying the wrong thing but I didn't! Yoplait- Save Lids to Save Lives! It's time for the Pink Yoplait Lids Again!!!! I love supporting causes that help everyone and really hope that you can help Yoplait by tracking and sending in your pink lids! We probably all know someone who was diagnosed with breast cancer and as a female, I want to do everything I can to help prevent my friends and family if they were ever diagnosed with this disease. One in eight women in the U.S. will be diagnosed with breast cancer within her lifetime - our friends, wives, mothers, sisters, neighbors - and this year, the fight against breast cancer starts right next door. In addition, you can visit http://bit.ly/slslcoupon to download a coupon* for $0.30 off any (1) variety Yoplait Yogurt cup (Includes Original, Light, Thick & Creamy, OR Whips!) today! I love when I get an opportunity for a Tastemaker of something that I actually use quite often. I have been a fan of the Viola! By Birds Eye ever since they came out in the early 2000's. This is one product that you will always see in my freezer. Even the chef will actually eat these! Viola! can be found in the freezer section of your grocery store and comes together in a snap. Once you open the package, you simply place the frozen product, water, and the sauce packet into a saute pan and let it get to work. The meal will be ready in 10 to 15 minutes (and will take some stirring as well!). This time Viola! has gotten even better because they have come out with a Family Size! The regular size bag is enough to feed two people (or maybe one hungry person). The Family size can feed 3 to 4 people. Now for an offer for you! Just leave a comment if you would like some coupons for Viola! by Birds Eye. The coupons are for buy one get one free in both the regular size and the family size. last week and Cole's birthday was this past weekend and Labor Day is just around the corner. I love spending extra time with my boys and just enjoying lots of fun things with them. of our memories into Photo Book! lollipops, and even some late night trips to Target! You can also join in on the savings by visiting www.kodakgallery.com/creativity for your own photobook at 40% off! Disclosure: This post is a part of the Foodbuzz Tastemaker program through Kodak Gallery. I received a photo book for this program. Last week, while on Twitter, I kept seeing all these Tweets about Jennifer Perillo and the sudden death of her husband. I honestly don't know what I would do if I lost my husband. Every tweet I saw just made me be more and more thankful of what I had. Jennifer made one simple request last week and that was to make a peanut butter pie. And to make it in honor of the people that are with you now and celebrate the fact that you still have them. I've made peanut butter pie tons of times. I always use Pioneer Woman's recipe. Except this time I used Peanut Butter and Co Dark Chocolate Dreams PB because I had some. So here is my Peanut Butter pie and also a feeling that I won't be putting off desserts my husband or children wants. So, I love trying new things and I've been playing with the idea of putting some of the things that I try here on the blog. Hopefully on Sundays you will now be greeted with a Sunday Sampler post of something new that I've tried and what the results were. This week's Sunday Sampler is actually a sample I received from Foodbuzz. I'm a lucky Foodbuzz Tastemaker and Birds Eye has been giving us some great samples. I was super surprised to see that this was Chef's Favorites (especially being that my husband is a chef and it is really hard to beat his food!). The Birds Eye Chef's Favorites do not come out until September but definitely look out for them! I received four bags: Creamed Spinach, Roasted Red potatoes and green beans, and then 2 risotto packages. I love having frozen vegetables on hand because then it is something relatively healthy that I can get cooked quickly after work. We tried one of the risottos first and were pleasantly surprised. It's definitely not a fresh risotto but not too bad for frozen. Words cannot express how much I love fried green tomatoes. If a restaurant has these little babies on their menu, you can 100% guarantee that I will order them. I almost think sometimes that I have a love affair with anything that is green and fried because I love fried pickles, okra,etc. I also love when I accomplish making something for myself when my husband isn't home because I am really spoiled in the fact that I can say anything that I want and if he has time to cook, he will cook said item for me. I also do not remember seeing green tomatoes in the store as much as I have this year and thus the reason why I needed fried green tomatoes. I didn't deep fry these but just pan fried them and somehow? this makes them lighter. Hey, whatever works! While I love to bake, baking when it is 100 degrees outside is just not my idea of fun. However, sometimes life just calls for a cupcake. I was looking through Pinterest when I saw these Pina Colada cupcakes. I'm really trying to actually make some things that I see on here versus just looking and starting at them. I loved how easy these are and for my work friends they only have 3 Weight Watchers points! I decided not to make an icing but to just top the cupakes with Low fat whipped topping (cool whip) and to toast the coconut. I don't know how I have gone through life without toasted coconut but it is seriously one of my new favorite things. My grandparents (and aunt and uncle and cousins and many more family members on both sides of the family) live in Nashville and we decided to take the boys up there for a weekend. Cameron is absolutely enthralled with Greek Mythology and Nashville has an awesome park that has a life size replica of the Parthenon and Athena. It was fun to take the boys here and there had been some renovations to it since I had been as well. In 2002, they added the gold to her but I think I preferred her without the gold. We also made a trip to Las Paletas, which is an awesome little popsicle shop that has been featured multiple times on Food Network and even on an episode of Throwdown with Bobby Flay. At Las Paletas, we tried the Peanut Butter, Cantaloupe, and the Chocolate Almond Flavors. I am having a lot of fun this summer with the ice cream maker. I normally make ice cream at least twice a week and the chef is always excited to find out what flavor it is because I don't think I've made the same flavor twice yet. Unfortunately, I haven't made any ice cream that is dairy free yet but I need to try. We decided in January to keep Cole on a dairy free diet because keeping him off of dairy has helped him to stay well. The poor thing has had horrible luck with ear infections and after the second set of tubes and his adenoids were removed, he was still getting infections. While not everyone may agree with our decision, it has worked for our child and we were tired of seeing him suffer. This ice cream was a light, refreshing treat. It came together really easily and used one of my favorite ingredients, cream of coconut. I think I will probably reduce the amount of coconut flakes in the ice cream or replace them with toasted coconut. We didn't like the texture at first but after freezing over night did help the texture of the ice cream. So I am attempting to get out of my normal element in regards to strawberries. Up until this year, I didn't ever stray from normal, ripe, red strawberries and enjoying them with some sugar and maybe some whipped cream or cake or both. In fact, I'm not even a fan of strawberry ice cream. When I first saw this recipe on the Curvy Carrot, I was excited to see what it would be like because the flavors sounded amazing and I really like the combination of strawberries and balsamic vinegar. We actually made this the night that we got a gallon of strawberries and were very happy with the results. If you need a quick summer appetizer (that won't heat up your house! ), look no further! After seeing a few bloggers post about this “secret club”, I decided I wanted to see what this whole thing was about. Luckily, it was still taking new members and something that was really fun to do! It was excited to get the email about which blog I would get to cook from and see what I would like to do my take on! I was assigned to the blog, Every Little Thing. One thing that I learned about Stacy and her blog is that she loves to eat locally! I know all of us are (or should be) trying to reduce our carbon footprint and it was fun to see what she would bring home from some of the local St. Louis Markets. I've never been to St. Louis and for me, it was also fun to see her pictures from places around town. I decided to make the Crust Topped Tilapia from her blog but have definitely added my own spin to it. I showed my husband the recipe this morning and off his brain went. He recently had a special at the restaurant of tilapia so he wanted to re-create a fish dish that had been on special as well as take from Stacy's tilapia recipe. I know a lot of people aren't fish eaters but fish is something that everyone in our family will eat and is generally inexpensive. Here is another fabulous ice cream. I know I am big on not using egg in ice cream. I am going to try an egg custard based ice cream at some point over the summer but so far I'm on a run and still getting to know the ice cream machine so I don't want to try something new just yet. It's summer and it's hot and at 11:00 am one past Saturday, my sister was already craving something cool. She loves key lime pie and wanted a key lime pie milkshake but I told her to save her money and wait 45 minutes and I would have ice cream ready. We all loved this ice cream. In fact, it was gone the same day it was made. I was skeptical about the graham crackers but we all felt that it made the ice cream and took the tartness of the key lime juice of the ice cream. The First Ice Cream of the Summer!! This ice cream was absolutely wonderful. I am so glad I had buttermilk to use up! Now, I know what you are thinking. Buttermilk. YUCK. But honestly it make the ice cream creamier and have a slight tang. This ice cream didn't even last that long. After it was made, the husband ate it right up! I think this recipe also helped me to stop having a love/hate relationship with my ice cream maker. The secret is chilling the mixture before putting it into the ice cream maker! ok anyone else remember New Kids on the Block besides me? Anyway… does that tell you how excited I am? I’m singing old school NKOTB. And I seriously just wrote NKOTB. Sorry they are New Kids and always will be! I am currently sitting outside of a Panera in ATLANTA (which felt like the longest hour and a half drive EVER) and awaiting the weekend that is about to unfold. I’ve got dinner plans and party plans (seriously Tasty Kitchen announced a TK relaunch and blogger party for tomorrow night!) and I’m hoping that I don’t become a crab in a shell like I can be sometimes and be my outgoing self. Because I seriously am so excited. I probably won’t have any posts until Sunday but if you want to follow along in the Blog Her Food Journey come follow here on Twitter as I will be tweeting live as much as I can! I hope everyone else has a wonderful week! 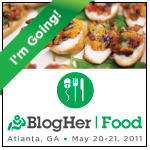 and If you are at BlogHer Food Look me up! It's very funny to me how much life can change even in the course of a week. A week ago, it was my last day at a job (and state) that I had been at for 18 months. These co-workers (friends) had planned an awesome day of celebrating change for two of us in our area. We got treated to lunch out. (What were we thinking too-- we went to a Mexican restaurant on Cinco de Mayo for lunch!) But one of the best parts was a fondue pot with chocolate and different things to dip in it was going all day long. One of my lovely friends had made her family's pound cake for the event. 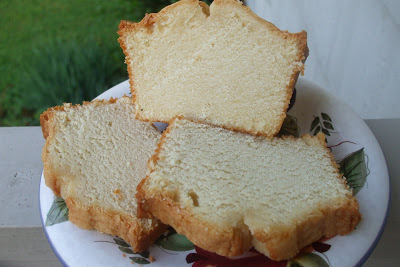 She had given me the recipe about a year ago and I had made it because I was looking for a really good pound cake recipe and trust me-- this is a great recipe. Her family also needed a place where the recipe would always be and that's why I am sharing it today! This recipe does make 2 pound cakes so when I make it, I normally keep one out and freeze the other one. Well, nothing new in the world but blogger being down as long as it was did mess up my plan to have something posted today. Hopefully I can get a few posts scheduled over the weekend. I start a new job on Monday and have no clue as to what it will entail as to time and access to internet as my old position I had pretty much unlimited internet access. So here’s to the end of Friday the 13th! I hope everyone has a great weekend! One of the many things we love about living back home is the Sunday Market. It’s held in a huge pavilion so it can be held rain or shine and there are over 15o vendors there of all different varieties. Today was Strawberry day and I can’t wait to use up these babies! 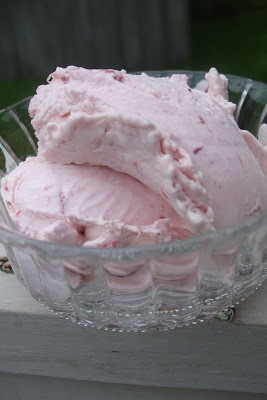 Strawberry Bruschettafrom the Curvy Carrot!!! I'm so excited to actually have a somewhat normal week ahead of us! My husband's restaurant opens this week, I start my new job tomorrow, and BLOGHER FOOD is Friday and Saturday!!!!WOOHOOO!!!! !